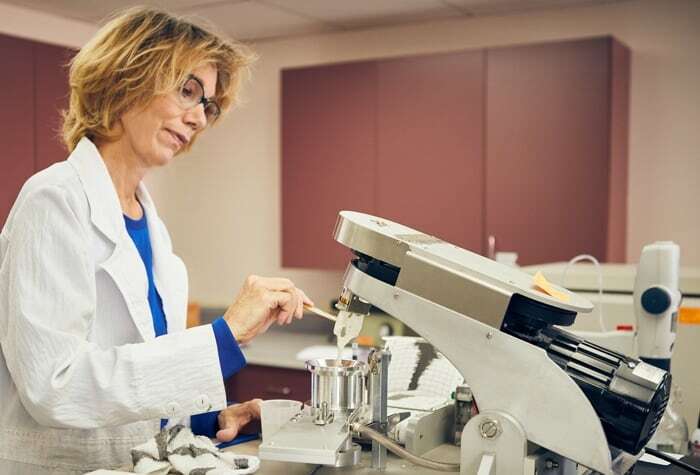 Cathy Butti, lab manager of the Syngenta wheat quality lab in Berthoud, Colorado, operates a mixograph. As an assistant plant scientist at Syngenta, Joy Battistone carries out her tasks with diligence, focus and precision. Her daily routine, however, is not consumed with the tasks one might associate with a research and development (R&D) professional. 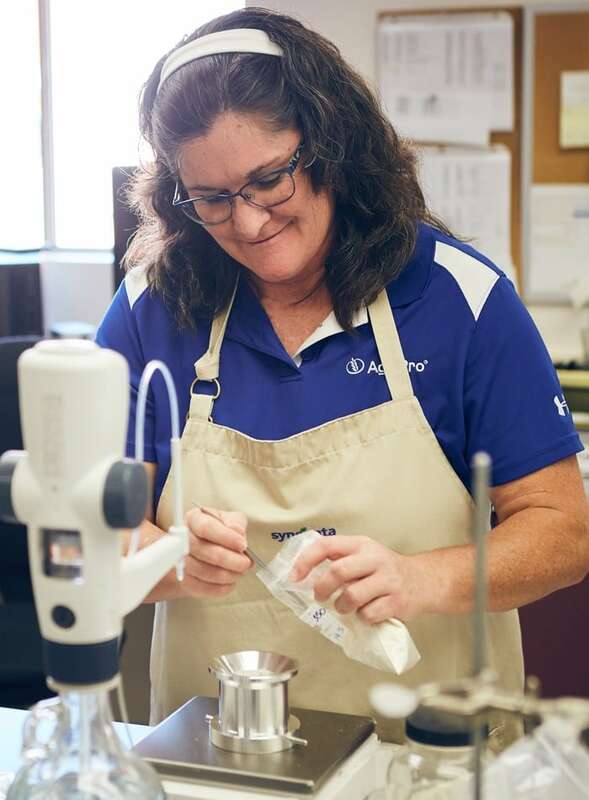 For the past two decades, she has donned an apron, instead of a lab coat, and spent her workdays baking cookies and loaves of bread at the Syngenta wheat quality lab to evaluate how various experimental Syngenta wheat varieties will perform—not in the field but in a bakery. The AgriPro #wheat brand from @SyngentaUS is a commitment to developing high-quality varieties. Located in Berthoud, Colorado, a sleepy town near the foothills of the Rocky Mountains, the Syngenta wheat quality lab is home to a full mill and bake lab, which has been in operation since 1979. There, Cathy Butti, Syngenta wheat quality lab manager, and her team receive grain harvested from experimental wheat varieties from Syngenta wheat breeders throughout North America—varieties that have excelled in yield and agronomic evaluations and for which breeders are seeking information on end-use characteristics, like protein content, gluten strength and other factors that are vital for millers and bakers. Syngenta Is Committed to Developing High-Quality Wheat Varieties: At the Syngenta wheat quality lab in Berthoud, Colorado, Quality Technician Brigette Maestas conducts a test. Syngenta Is Committed to Developing High-Quality Wheat Varieties: The Syngenta wheat quality lab is home to three laboratory mills, which use rollers to grind wheat samples. Syngenta Is Committed to Developing High-Quality Wheat Varieties: Grain samples are milled to evaluate wheat milling properties, including flour extraction and nonflour by-products, such as bran. Syngenta Is Committed to Developing High-Quality Wheat Varieties: Flour, water, shortening, sugar, salt, dry yeast and a dough conditioner are mixed together to create the dough for a pup loaf. Syngenta Is Committed to Developing High-Quality Wheat Varieties: Assistant Plant Scientist Joy Battistone forms bread dough into a loaf. 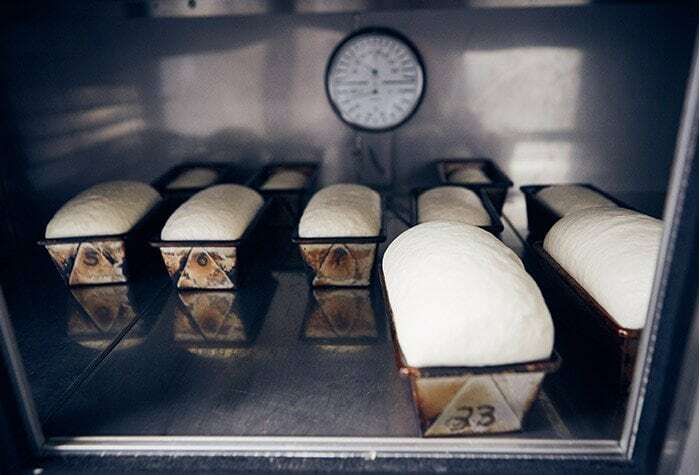 Syngenta Is Committed to Developing High-Quality Wheat Varieties: Pup loaves are placed in a fermentation cabinet prior to baking. 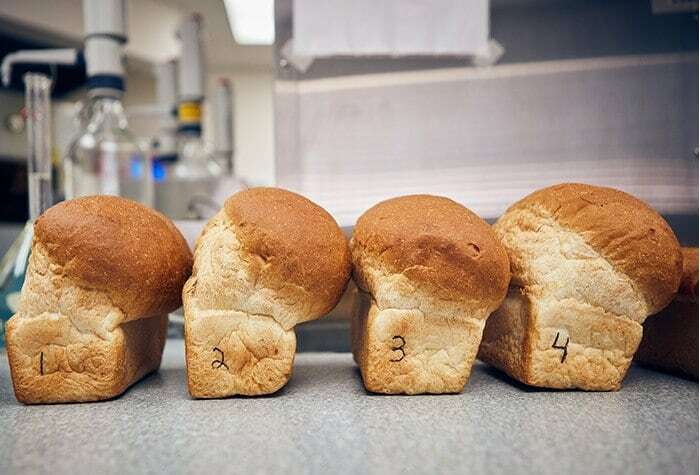 Syngenta Is Committed to Developing High-Quality Wheat Varieties: Baked loaves from the U.S. bread process are evaluated for their break and shred, which is the way the bread rises above the pan. Syngenta Is Committed to Developing High-Quality Wheat Varieties: The crumb characteristics of the bread are evaluated on color, texture, and grain or cell structure. Syngenta Is Committed to Developing High-Quality Wheat Varieties: Baked sugar snap cookies are evaluated by measuring the diameter and assessing the top grain. Five-hundred miles away, in the heart of the Wheat Belt, Breeding Lead Sarah Battenfield, Ph.D., and a team of Syngenta wheat breeders based in Junction City, Kansas, are tasked with developing new AgriPro® brand wheat varieties. To say their work is complex would be an understatement, given the crop’s natural means of reproduction by self-pollination, an extended growing cycle that translates to significant gaps between crop generations, three distinct genomes comprising modern wheat’s genetic profile, and an ongoing quest to deliver high-yielding varieties that produce high-quality grain. For Battenfield and her colleagues, end-use quality is just one of many factors considered during the R&D process. They monitor and evaluate yield and agronomic characteristics, like disease resistance, first and foremost. Only experimental varieties that perform as well as or better than existing commercial varieties in the field proceed to the next stage of the screening process at the wheat quality lab. When wheat samples arrive at the wheat quality lab, workers organize them and assign to them unique barcodes, which accompany the samples throughout the various iterations of milling and baking tests. These testing protocols follow the procedures that the American Association of Cereal Chemists International established. Tests vary by wheat class and development stage but may include sophisticated imagery technology to assess grain protein and hardness, milling processes to examine potential flour yield, and specialized instruments to measure properties that are critical to the success of industrial baking operations. 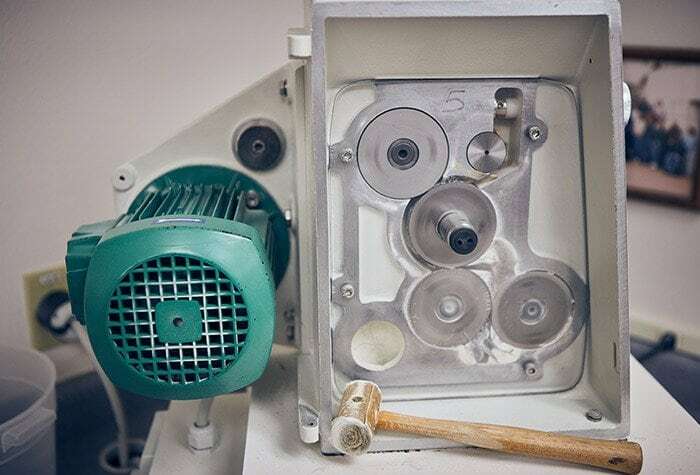 Testing the mixing properties of flour, for example, requires a mixograph, a pin mixer that combines small samples of flour and water to produce dough, while recording the resistance of the dough. The resulting mixogram, a collection of graphs not unlike a Richter scale reading, provides valuable insight into gluten strength, absorption, mixing peak time and mixing tolerance. In the bake lab, Battistone’s cookie- and bread-baking work isn’t as carefree as it might sound. Baking for the purpose of evaluating end-use characteristics requires consistency, repetition and complete focus. 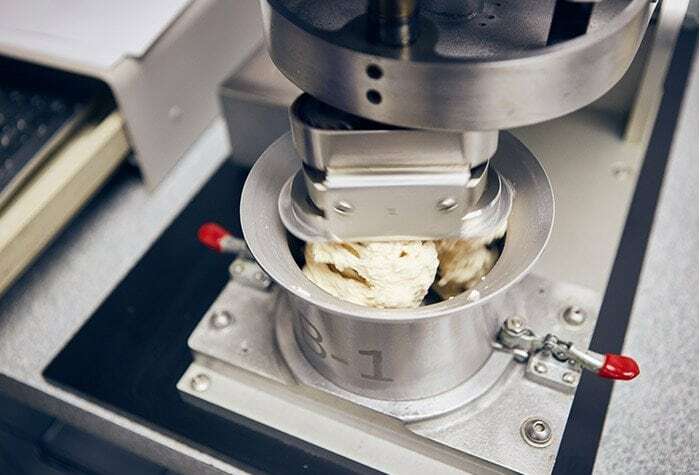 The baking protocols Battistone employs are thoroughly scientific—from the number of times and the direction in which the cookie dough is rolled, to the orientation of the bread dough roll when placed in the loaf pan, seam side down. “Consistency is really important so we can ensure that flour is the only variable that changes and that the wheat variety is the only unique factor being evaluated,” Battistone says. Battistone analyzes several capacities of the baked goods. 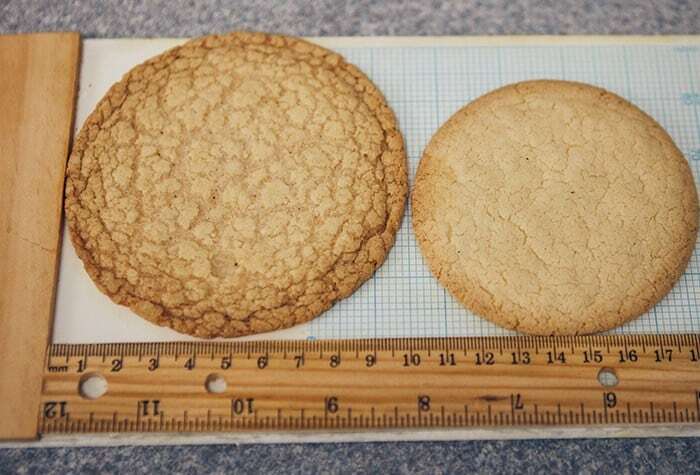 For a cookie, which is made using soft wheat, the primary distinguishing characteristic she looks for is cookie diameter, but top grain—the vast network of textured cracks in the cookie’s surface that is desirable in a sugar cookie or snickerdoodle—is also key. 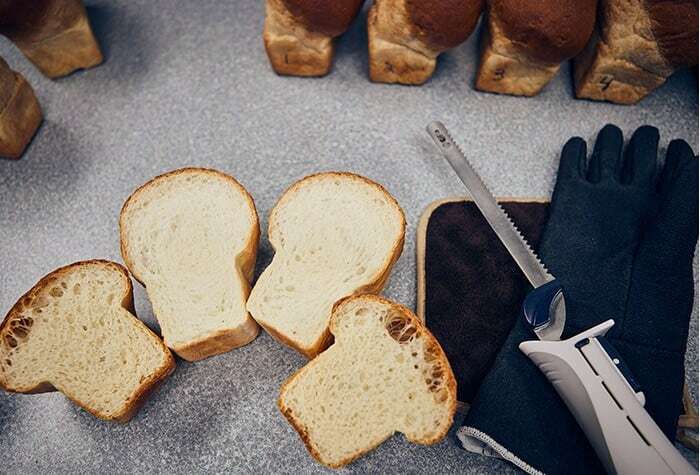 For lines evaluated for Canadian bread products, Battistone evaluates the break and shred—which is the loaf-top ratio or the way in which the bread rises above the confines of the pan. Also important is the color of the loaf—analyzed with the help of a specialized color booth—as well as the inner texture of the cut loaf, which should be soft, silky and slightly spongy to the touch. 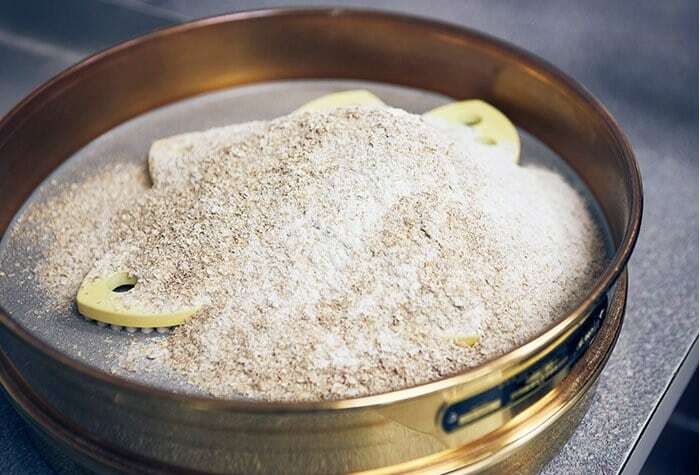 Generally, for all products, the least amount of flour a baker can use to fill their packaging is most desirable as long as other characteristics are good. As Battenfield presses onward in pursuit of developing wheat varieties with end-use quality characteristics, a photograph depicting her childhood self in her father’s wheat field reminds her why she has chosen this path.